Here is the second Nine for IX title that I got to in the course of the month, you can find the other above. This film deals both with a sport and an event that I had no familiarity with. In the case of some documentaries that could be a hinderance, in the case of this film it is most certainly not. The precepts of no limits free-driving are simply told enough and the film dramatically, both through recounting of facts, various interviews and use of split-screens and incredibly harrowing footage that audiences do need to be warned of, recreates events such that as a film it overcomes the lack of cooperation in interviews by the key figure in question. No Limits conveys this terribly tragic event in jaw-clenching fashion, is not recommended for the feint of heart or weak of stomach, but is an excellent documentary nonetheless. This post is my first contribution to the Russia in Classic Film Blogathon. I have always wanted to sit down and define what to me were the “Great Stories.” By great stories what I mean is those stories where I can watch many different adaptations of it without tiring. This particular story, like many that would be on that as of yet un-drafted list, is one I’ve enjoyed since childhood. 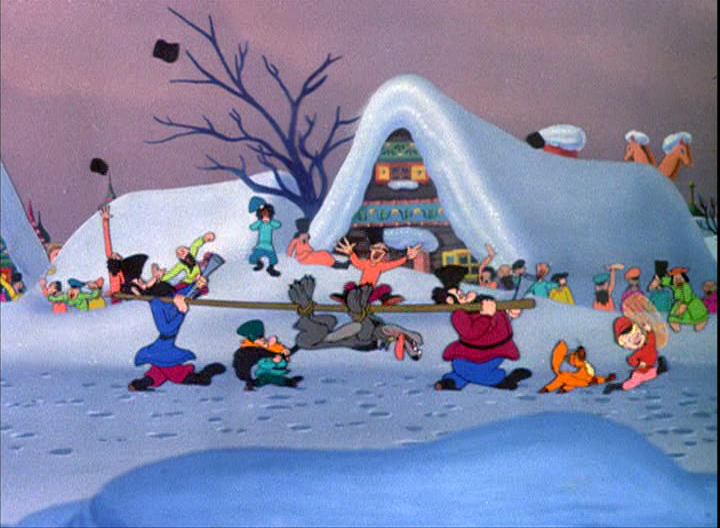 This 1946 Disney produced version is the one I first saw. Since discovering and re-discovering it several times over I have since sought out other versions of the story, including: A ballet produced by the Royal Ballet School; a live action/animation hybrid with characterizations by Chuck Jones and a Soviet stop-motion animation film from the ‘50s (this version will soon be featured on a Short Film Saturday post. As well as crafting my own version for the stage for young actors and musicians to perform. What I believe draws many to this story is, of course, Prokofiev’s music, but also the inherent humor many have found to counterbalance the true scares the plot points can offer. For the purposes of this blogathon, and to mesh with my March to Disney theme, I will focus solely on Disney’s 1946 version created for inclusion in the anthology film Make Mine Music. This version was also later siphoned off as its own short and released on video (once with the original Sterling Holloway narration, and one time now) and it also accompanied a theatrical re-release of Fantasia, which is rather a perfect pair. Make Mine Music, I recently discovered is yet another title that has been subject to Disney’s self-censorship having lost an entire segment in all subsequent releases due to concerns over racial insensitivity. However, that is but a compelling footnote here. What compels here is the treatment of Peter and the Wolf within the longer piece. It’s interesting to consider that this short film was fashioned just 10 years after Prokofiev’s opus debuted, a debut he himself cited as being inauspicious. So in many ways this animation truly is largely responsible for popularizing and immortalizing the piece; at least in the west. Like many lasting works it wasn’t an instant success. Much like Disney did with the Seven Dwarfs (who had no names in Grimm’s version) he named Peter’s animal friends (Sasha – Bird; Sonja – Duck and Ivan – Cat) and the hunters were also named (Misha, Yasha and Vladimir). I have written extensively on divorcing oneself from a prior incarnation of a narrative when watching the film. However, when discussing different versions of a work noting changes matters. The introduction of the representative instruments remains, yet the situation with the Duck’s fate is slightly changed from the original. 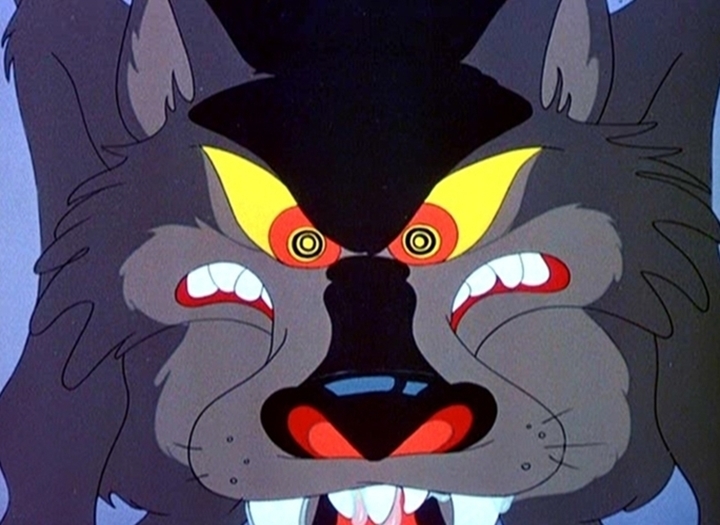 The short balances real scares like the wolf’s appearance in general, his threatening the duck and other’s are balanced with humorous touches, like Peter’s pop-gun, pantomime action and voice-over dialogue. This follows through to the ending with Peter’s presumed fate and his heroic reveal. It truly is a fairy tale set to music that also includes some of Disney’s didactic proclivities by having signs in Cyrillic then dissolve to translated versions after being misunderstood. This helps indicate to even the youngest audience members that the story is foreign in origin, but allows them to relate to it through the narrative storytelling technique. The main action sequence of the film is very well and dramatically rendered. Furthermore, at 13 minutes there’s a more grandiose sprawl to this tale than standard six-to-eight minute shorts allow. Yet, with the musical score usually clocking in around 25 minutes in length it moves more briskly apace than that. Add to that the typical deep, intricate backgrounds, and fanciful setting that Disney can create, and you get a world that is fully realized and dimensional. A narrative landscape that seems much larger than indicated and seems to belie the modesty of budget likely implemented (I hypothesize somewhere between pre-War opulence and wartime belt-tightening). It’s a rendition that has stood the test of time, and like much classic animation, has come to define pieces of classical music in the minds of those who know it. Whether individually or as part of the underrated Make Mine Music it’s a short that is worth knowing whether you’re a Disney enthusiast or not.